History is getting better and better. Not because it’s changing drastically, but because the way it is being told to readers is changing. More and more, history is being told the way it actually unfolded, and not simply in the “happily ever after” format. 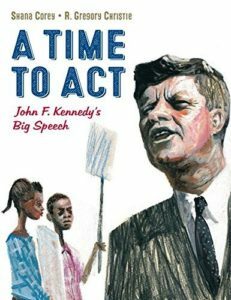 Case in point: the new picture book by Shana Corey called A Time to Act: John F. Kennedy’s Big Speech. Ms. Corey does not tell Kennedy’s story in the typical “he bravely did what was right and did not care what anyone thought” way that most hero stories are told. She tells it as it unfolded, showing how Kennedy—for all his power, influence and prestige—was actually hesitant about speaking up for equality because he did not know how his actions would be received. This slowness persisted. Freedom Riders were attacked as they tried to integrate buses and Dr. Martin Luther King, Jr. asked Jack to help outlaw segregation, but Jack did nothing. Until the day black children and teens left their Birmingham, Alabama classrooms to march peacefully to end segregation. When they were blasted with water hoses and beset upon by vicious police dogs—and when their ordeal was blasted all over the news, Jack finally acted. He went on television and said, “This nation…will not be fully free until all its citizens are free…” And this time he didn’t care what anyone thought. 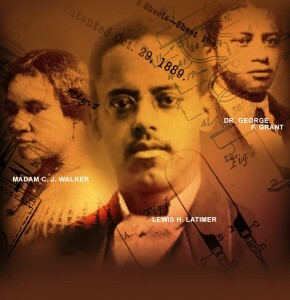 This is a timely and relevant book, not only because it is a slice of real American history, but also because it is a prime example to children everywhere that sometimes it takes a while to find the courage you need to do the right thing…but sooner or later you find it. Ms. Corey’s prose rings natural and true, and will definitely feel relatable to young teens and ‘tweens who are seeking to define themselves and their principals. Artist R. Gregory Christie’s illustrations of children with elongated necks and determined faces courageously carrying the signs that demand equality all help to loan a collage-ish look and feel to this important book. Use this to teach tolerance, equality, integration, social studies and the fundamentals of American laws. Next articleMeet DeVon Cooper and His Brainchild: INIQUITY!